The weather’s starting to warm up, and portable projectors are getting really good and cheap, so it might be time to invest in a projector screen for your next outdoor movie (or March Madness viewing) night. 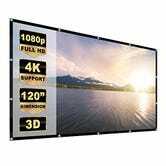 This 120" screen is only $15 today with promo code XLQ69BTW, and it supports double-sided projection, and includes a bunch of hooks, stickers, and ropes, so you can find the best way to mount it in your home or lawn. Just invite me over, I’ll bring popcorn.